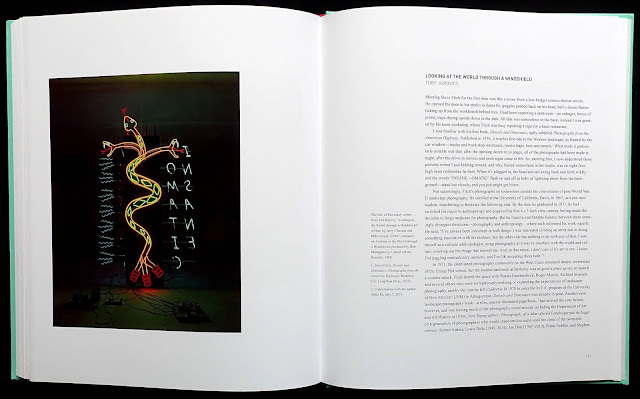 German photographer Kai Loffelbein captured the e-waste phenomena in this book with 117 photos from Abogbloshie, Ghana, New Delhi, India and Guiyu, China. 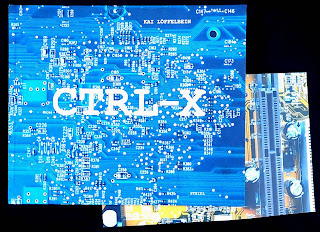 Tons of this electronic waste is send to these countries and though there are no captions it looks like some of this waste, in particular TV sets, are checked to see if they are usable for sale in local markets. 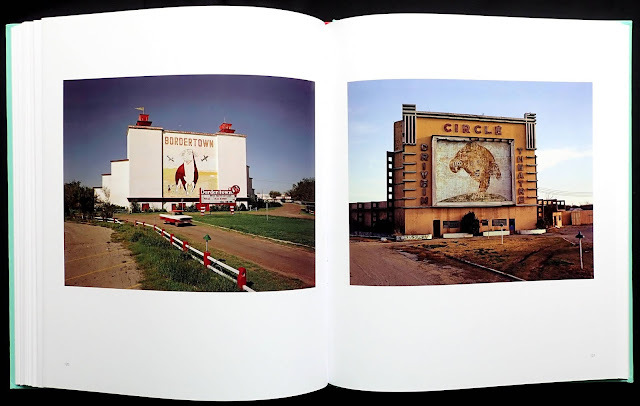 The photos of Abogbloshie (a suburb of Accra) don't actually show much recycling of the valuable parts of e-waste, rather the locals seem to be scavenging through the rubbish to see what they might find. 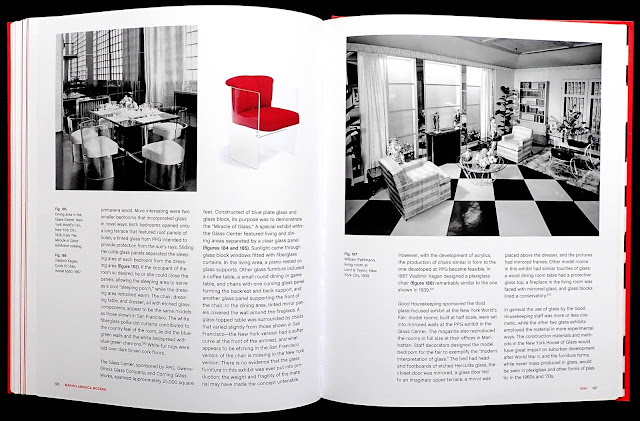 The Indian and Chinese photos show a much more practical approach to sorting through the electronic components, Chinese ladies are sitting at tables with lots of different small containers to hold the various parts. 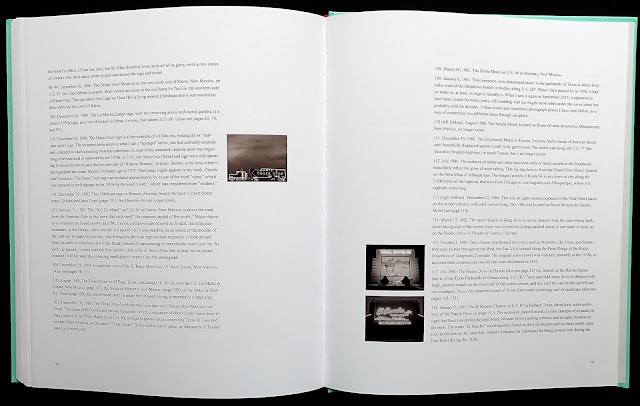 Several photos show the waste arriving in big sacks with no earlier separation of the contents, other photos show piles of the same components having been sorted and frequently just left in a factory yard. There are two essays in the book and both suggest that the world cannot carry on producing such huge amounts of electronic waste but I thought the Chinese photos showed that it is possible to organise recycling though in a very crude way at the moment. I wonder if robots might do all this in the future? 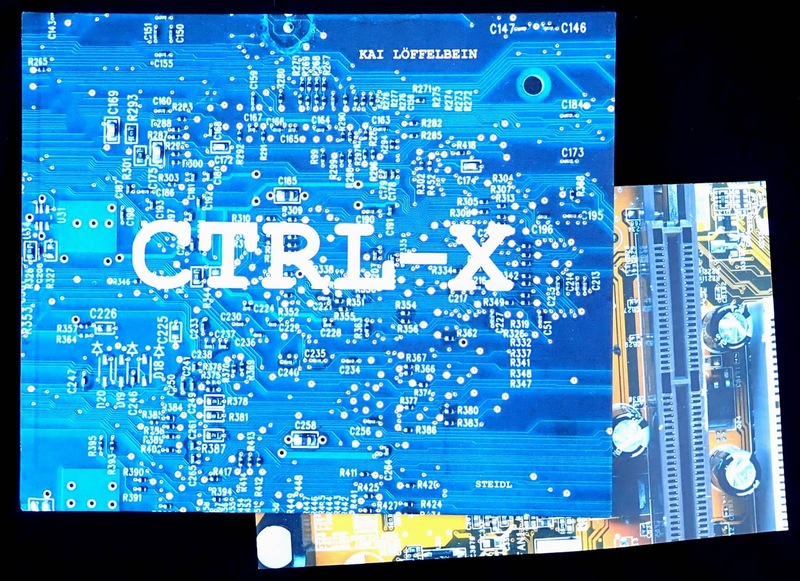 These documentary photos are certainly a powerful reminder of the e-waste problem but without any captions the images tend to lose some credibility and it's left to the reader to make sense of each picture. 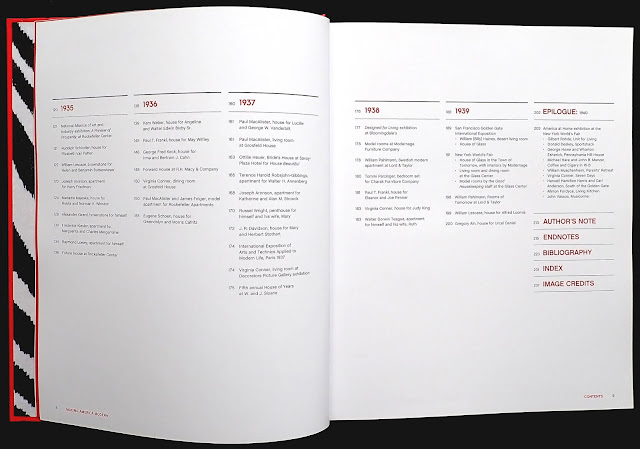 This also applies to the book's twenty-four page loose insert. 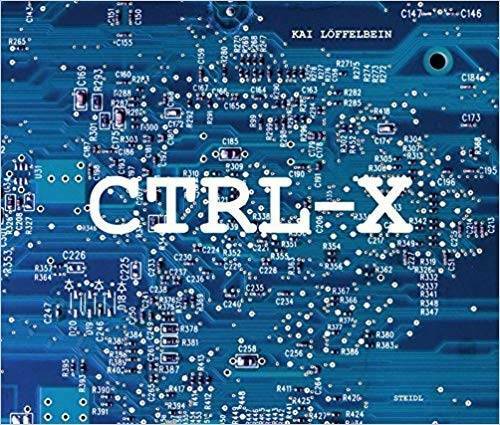 It has no text but some wonderful close-up photos, taken by Loffelbein, of circuit boards showing hundreds of tiny parts found in any of today's electrical products (the book's cover has one of these photos). 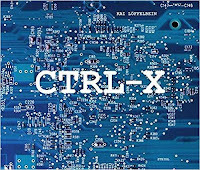 The production of these circuit boards is done by robots. 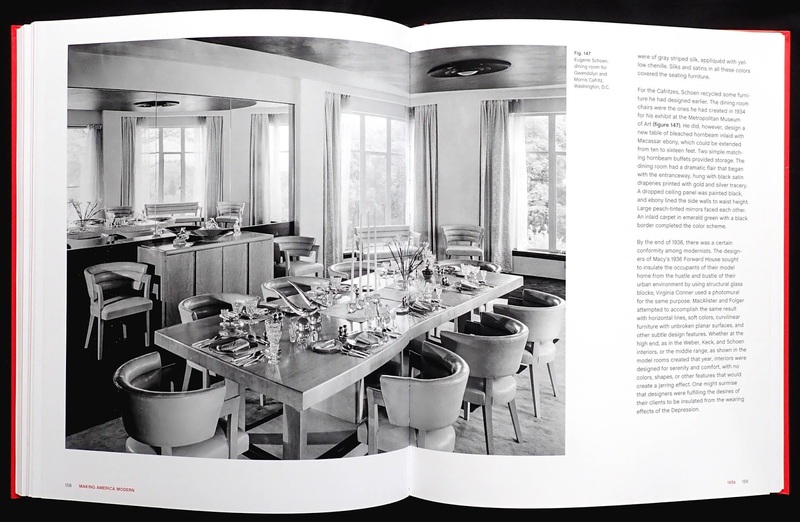 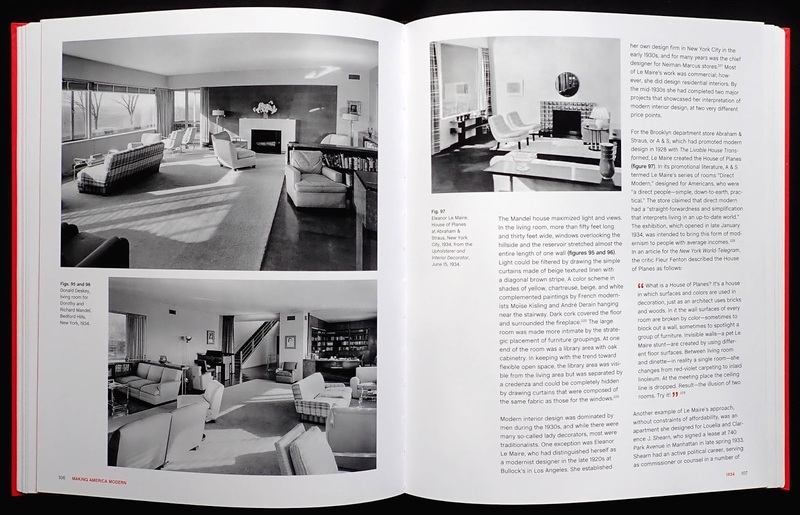 Marilyn Friedman's book is a wonderful visual celebration of American home interior design. 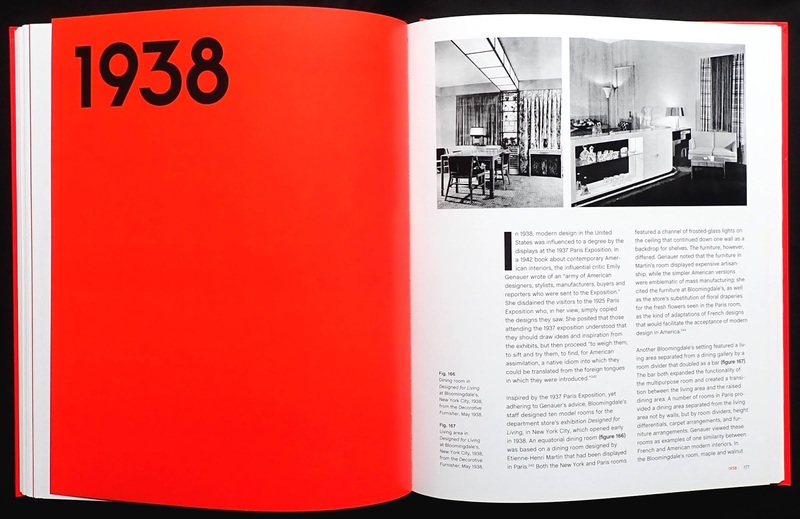 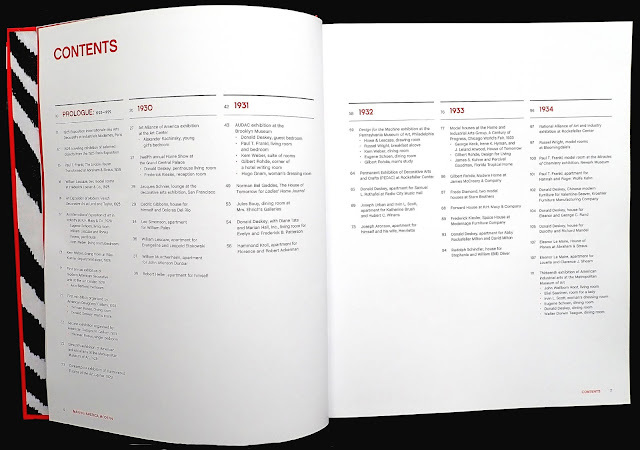 The 203 black and white photos (though a few are in color) are divided into each year of the thirties and the text provides a sort of running caption about the photo's content, the designer and creative trends for that year. 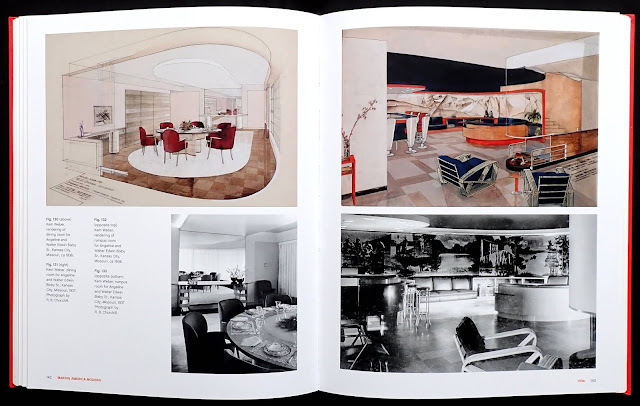 It seems extraordinary that through the Depression years there were moderne room sets in department stores, exhibitions, art galleries and individuals were commissioning designers to create living space reflecting the ideals of the modern decorative arts. New materials helped too, Monel metal, acrylics and glass allowed designers to create products with simple, straightforward lines that easily blended into contemporary rooms. 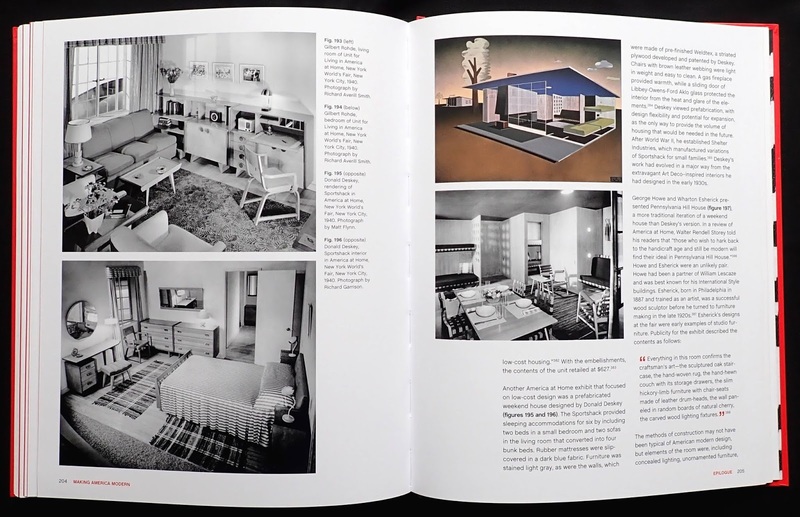 What particularly impressed me about the book is the quality of the photos. 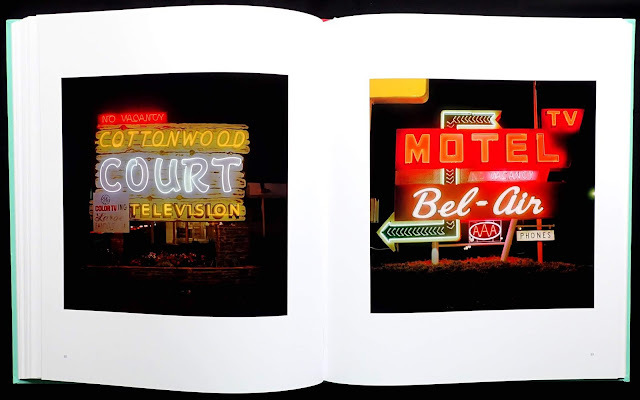 Considering these were taken over a ten year period by a variety of photographers they all have a uniform lightness and sparkle (printing on excellent matt art paper with a two hundred screen helps, too). 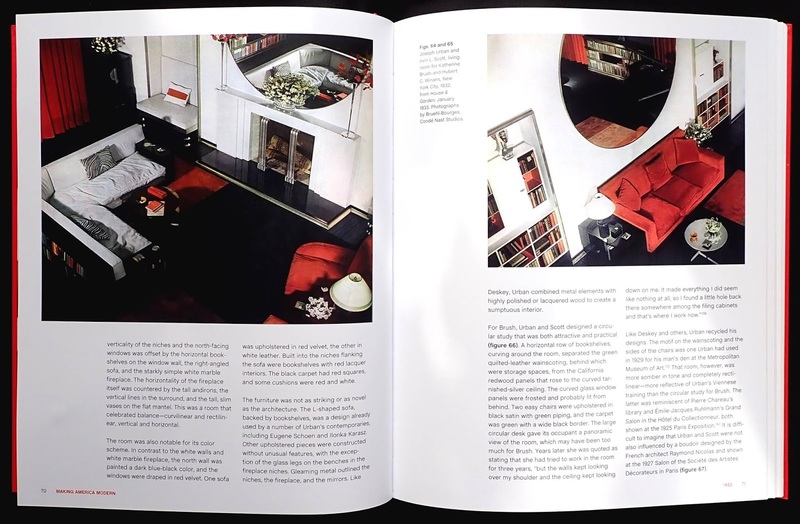 In the Prologue there some photos that also appeared in Friedman's 2003 book Selling good design where they look dull and lifeless in comparison. 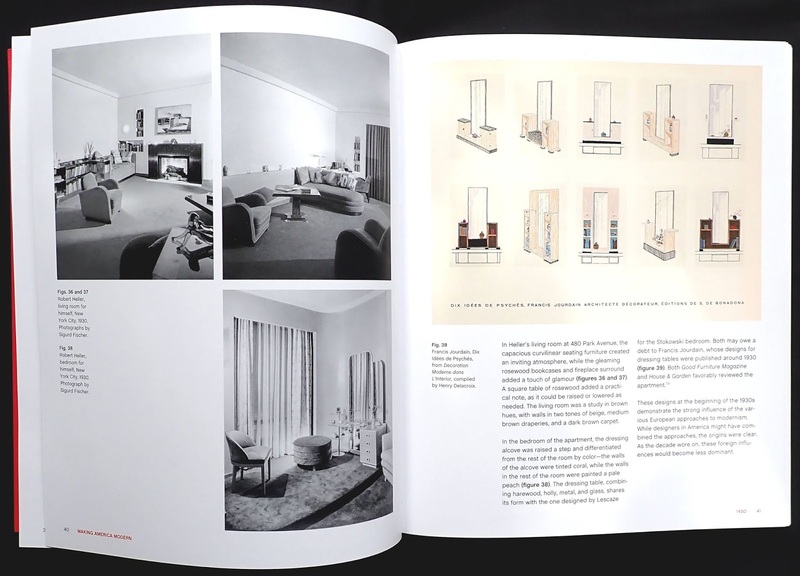 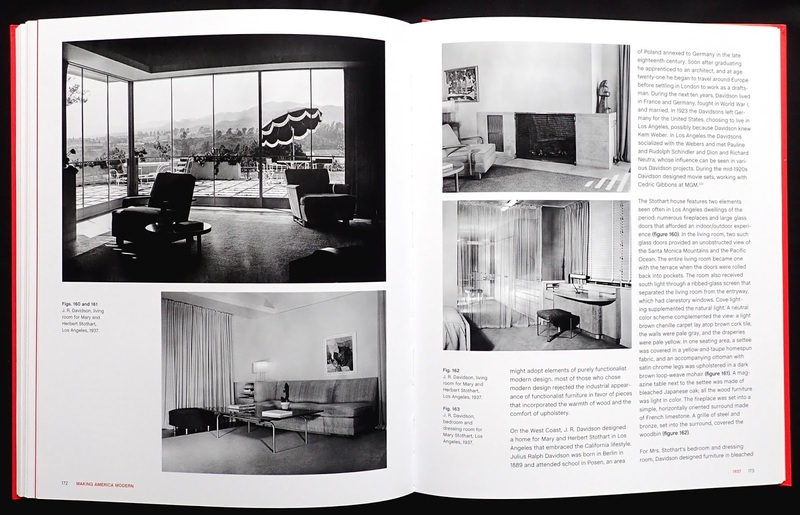 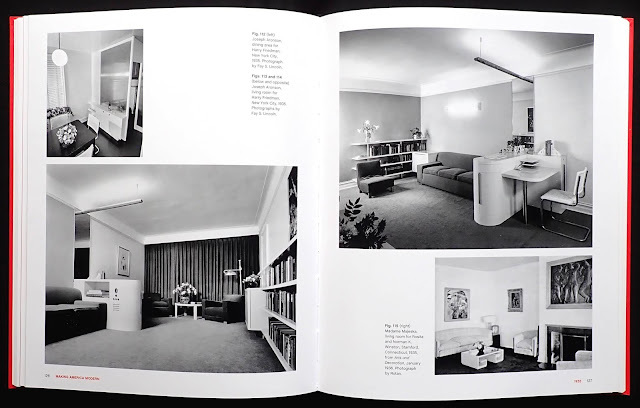 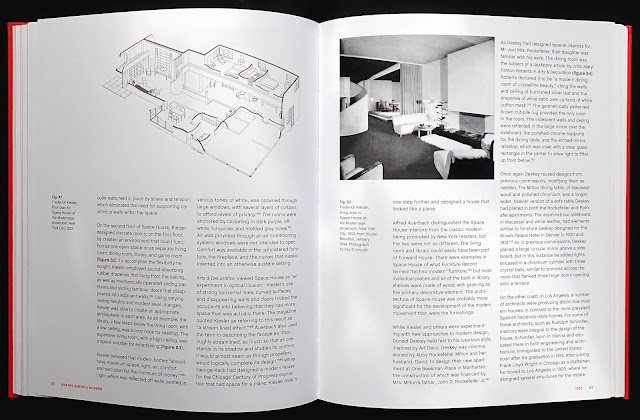 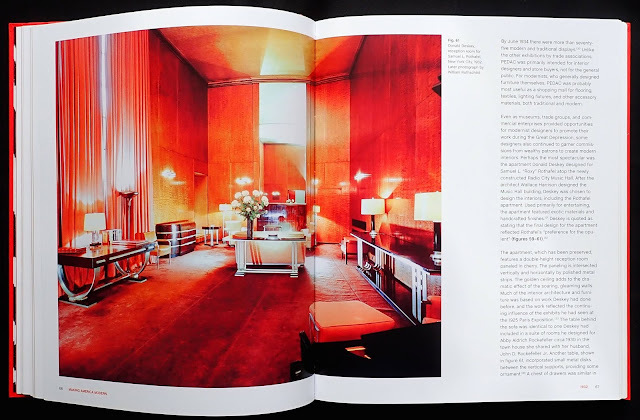 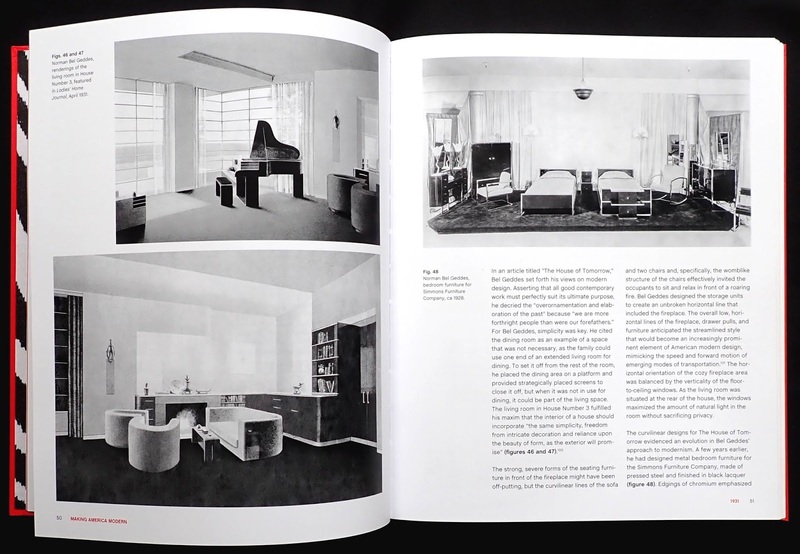 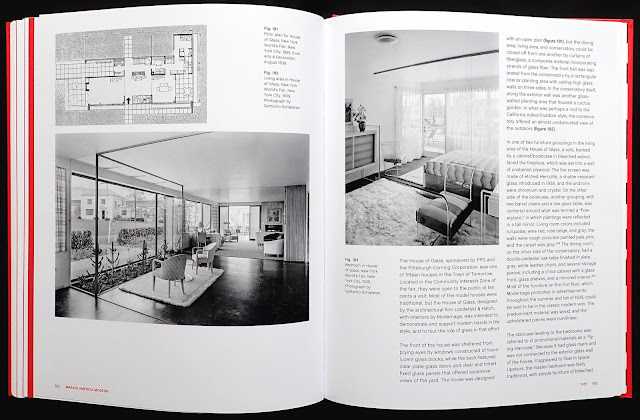 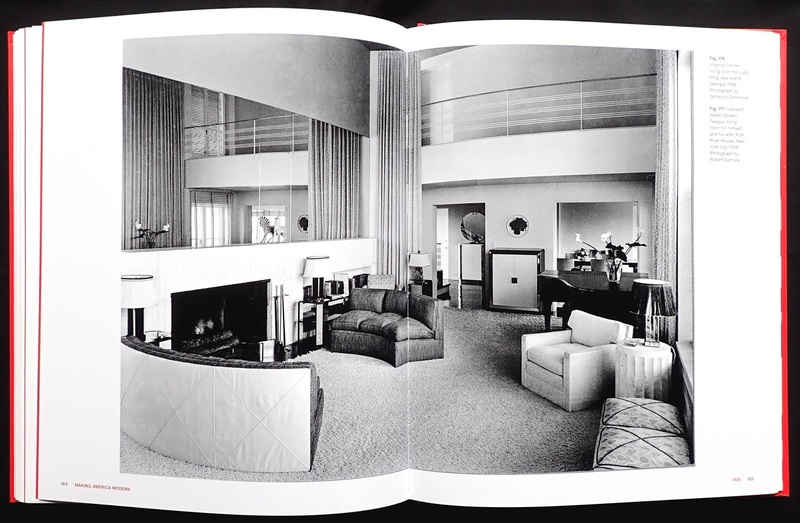 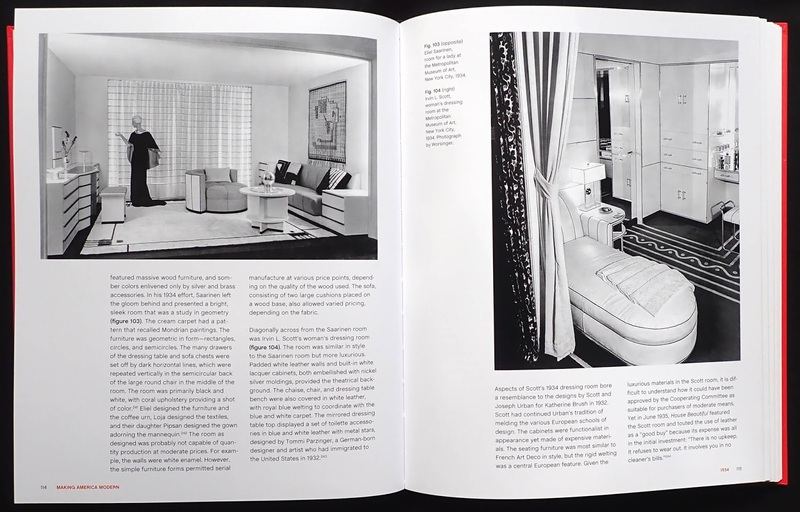 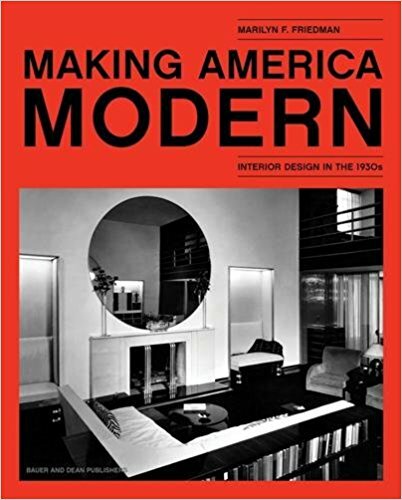 I found the book (and Matthew Egan deserves a mention for the excellent design) an interesting overview of American interiors by fifty or so very creative designers who helped to define modern living in past decades. 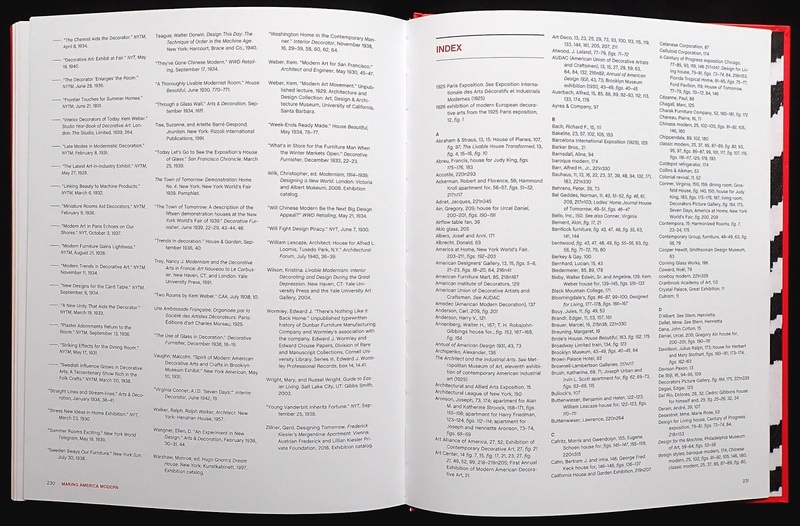 This is one of two fold-outs in the book. 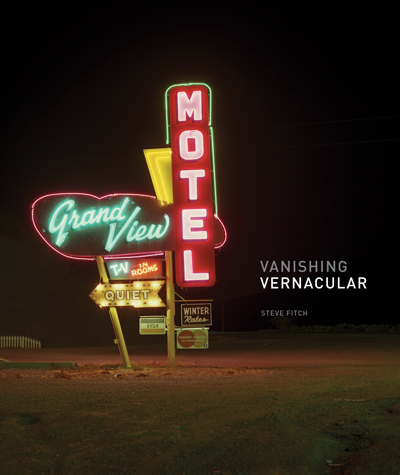 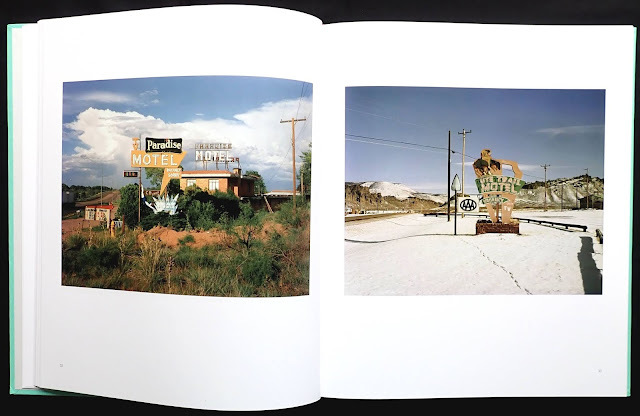 Steve Fitch has been roaming the Plains and far west for years searching for examples of vernacular commercialism before it disappears. 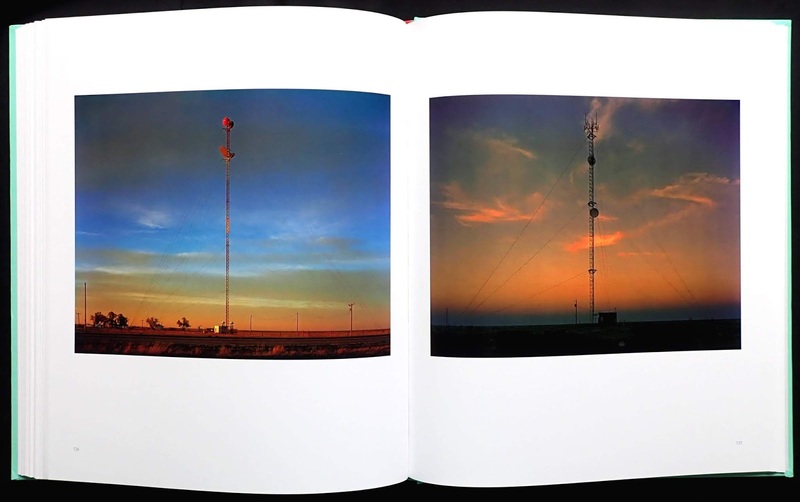 His first book 'Diesels and dinosaurs' published in 1976 set the scene with fifty shots of what could be seen from the highway and this new book continues the theme with 127 color photos. It's an interesting journey with the photos of centuries old traveller way marks and more recent examples of signs for motels and farms, most of the hand painted signs, which have now seen better days, probably will have gone when Fitch returns to their location. 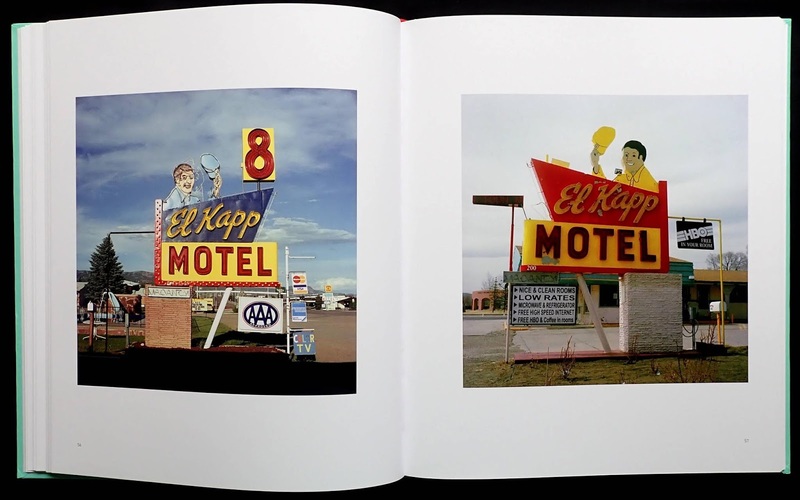 These images morph into the essence of the book: motel signs and drive-in movie theaters. The motel signs deliver forty-three wonderful photos of giant arrows, angled poles and irregular shapes bursting out of the ground and painted in contrasting colors. 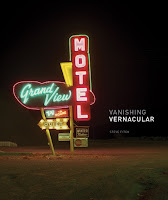 (It's interesting that the word motel is always in capital letters with other words in lower case.) 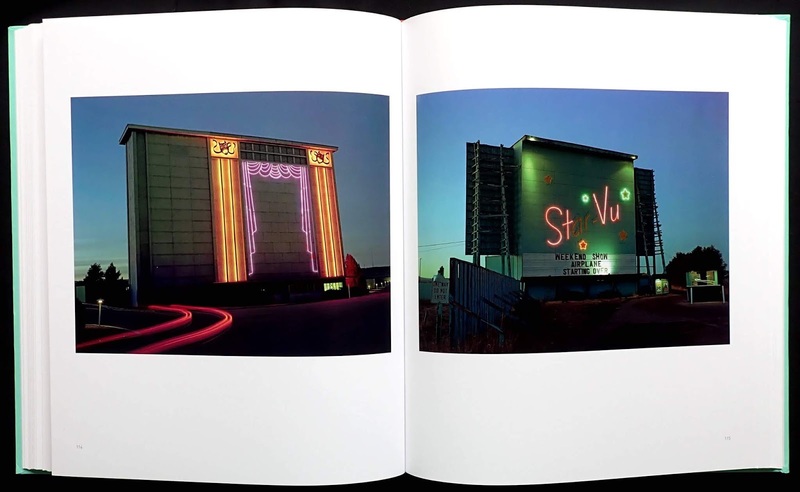 These signs come alive at night with neon lighting up their immediate area, look at the book's front cover for an example of this. 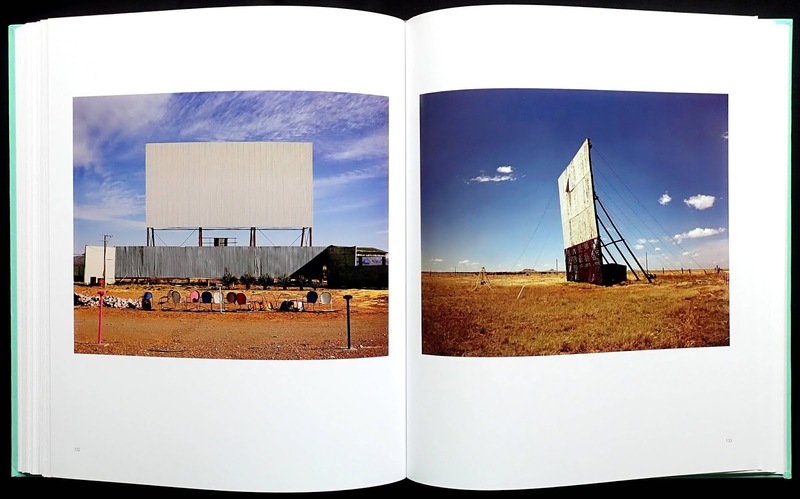 Fitch says that many of the signs which he photographed in the eighties and nineties have now gone and this also applies to the drive-in movie theaters, eighteen examples are shown. 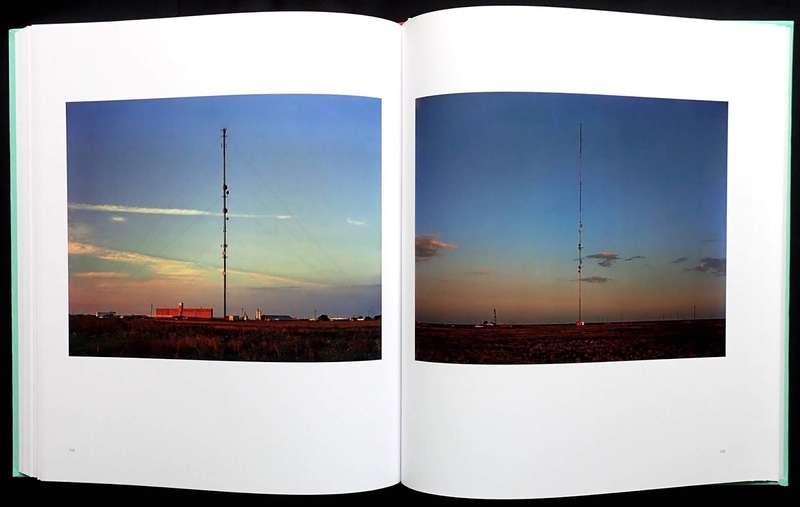 Though the book is concerned with vanishing vernacular in the commonplace landscape I wasn't prepared for the last photos in the book: twelve quite extraordinary photos of radio masts. You might wonder how a slither of metal lattice work could generate such creative images but Fitch photographed these uprights in a totally flat landscape at dusk with a background of an almost rainbow colored sky. 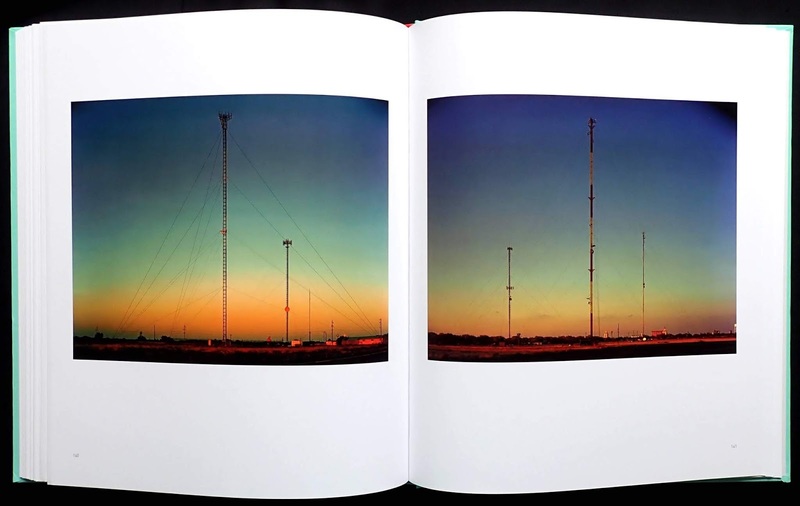 I found it interesting that although the masts might seem very similar they are different with round communication dishes attached at different points on each mast. Nicely the complete mast is shown in each photo. 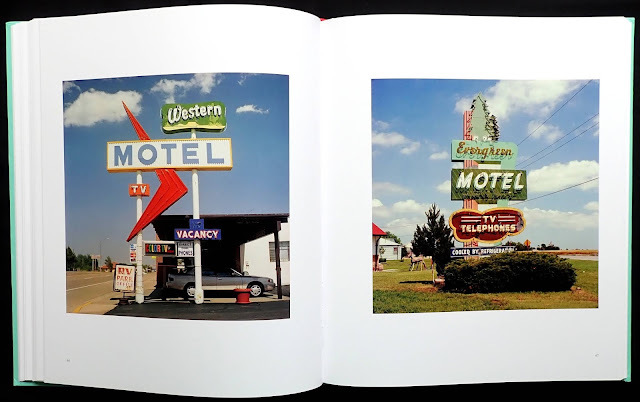 Fans of commonplace Americana will enjoy these photos, the book is a handsome production (three hundred screen printing on a lovely matt art) with one photo a page and generous margins. My only (very minor) complaint might be the comprehensive photo captions on eleven pages at the back of the book require a lot page flipping backwards and forwards.